6. Different reactions: Simon sees the woman as sinful, Judas sees it as a waste of money. We have all seen beautiful pictures of this event, but many of them contain common errors. 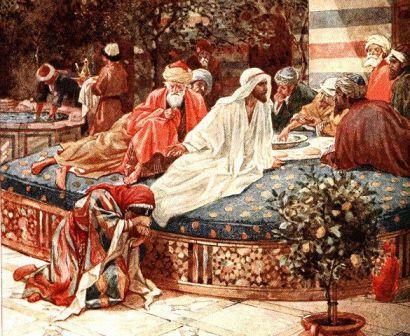 The most frequent error I see is that most paintings depict the woman approaching Jesus from the front as He is seated at a table in a chair. The custom of the day was to recline at the table on one's left elbow, so her approach would have been from the rear. The next most frequent error I see is that the vial of ointment is painted intact with the lid lying to the side. Not accurate. That vial had to be broken in order to get the ointment out. 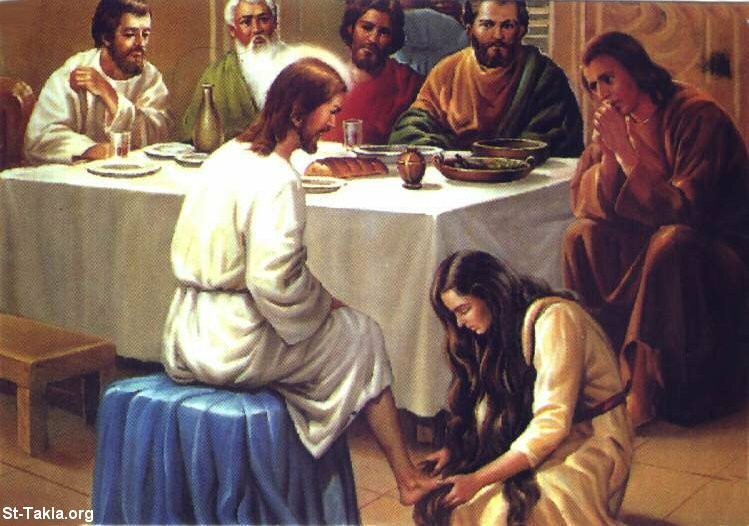 And that is very significant of the fact that the woman had to be willing to pour all she had out on the feet of Jesus. She held nothing back. She could not use a little of the precious ointment, put the cap back on and go home to use it another day. It was all or nothing. The picture to the right is probably a more accurate portrayal. When I was writing the story, I was struck by the courage that sinful woman had to have to do what she did. 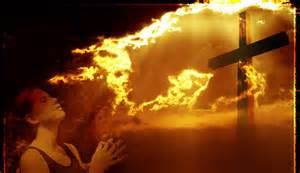 She was in a place she wasn't supposed to be; she did something she wasn't supposed to do; she opened herself up for scorn and criticism because of her worship of the Messiah. Something had happened to her to make her cast all caution to the wind to worship Him. I wonder what I would have done in her place. 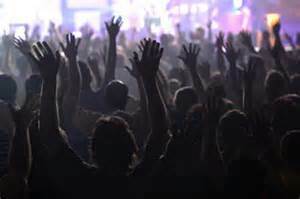 Would I have had the courage to buck the social mores to get to Jesus and worship Him with all I had? More pertinent would be, do I have the courage to worship Jesus lavishly today, even amid comments of scorn and whispers of criticism? This woman was evidently well-known in the village. Her reputation had preceded her. She certainly had no invitation to come to the banquet, and the women could only stand around the edge of the room and watch. I'm sure many self-righteous participants at the banquet made comments such as, "What is she doing here? We all know what she is." with all of his heart. "Hmmpf! He's at the bars every Saturday night. What's he doing here?" I wanted to say, "So how do you know he's always at the bars anyway?" But instead I said, "Praising Jesus for forgiveness of sins, I would guess." Whether we've sinned by living a reckless, immoral life style, or by slandering our neighbor, we all need forgiveness. That's something to worship Jesus about. Let's do it lavishly. Jesus is worth it. Thank you for your post, Golden. We certainly all need forgiveness and we a blessed that God forgives. Yes, we all desperately need forgiveness. Thanks for your comment. All these years of reading and hearing this story, and I didn't realize there were two different instances of this. Wow! Golden, if you get the chance, can you give us the two scriptures for both events? I'll have to read them again and compare. So interesting! Sure! Luke 7 carries the account of the unnamed woman's anointing of the feet of Jesus. Matt 26, Mark 14 and John 12 tell Mary's story. So glad you are enjoying them! Great post, Golden. Thank you for this insight. You bet! I love finding out these little known details in the Bible stories. I love the concept of "all or nothing." What a tremendous challenge for all of us to give Jesus our all. Thanks for sharing. You're so welcome, Karen. Thanks for stopping by.